There isn't a correct amount of shares you should allocate to a shareholder, as this depends on circumstance. If you have more than one shareholder, keep in mind whether to give an equal or an unequal allocation of shares. For example, Shareholder A owns 1 share, and Shareholder B owns 1 share. This means they both equally own 50% of the company. We default the shares at 1 = £1 just to keep things simple. However, you can change the number and value of shares should you wish to. If you're the only director and shareholder, you could simply issue 1 share to yourself. This means you own 100% of your company. 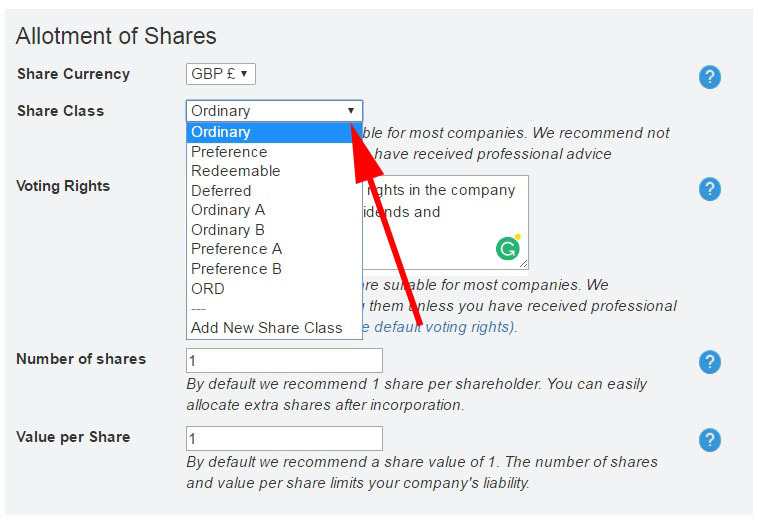 Should you wish to allocate 1p shares, please enter the value as "0.01" in the "Value Per Share" field. When going through our online company registration, you can choose different share classes. We recommend to leave the default class as "Ordinary", however, you can change the share class by clicking the "Change Share Class" link. When choosing a share class, the default voting rights will automatically appear. You will need to update the voting rights i.e, if you choose multiple share classes, the voting rights should be different for each class. If ever you want to revert to the default voting rights, just click the "reset to the default voting rights" link. Please note: Ordinary shares are suitable for most companies. We do not recommend changing them unless you have received professional advice. Once your company is incorporated, you can transfer existing shares in your company to new or existing shareholders, or you can issue additional shares. Then, you must tell Companies House within one month if you issue shares, and you must report all other changes to your share structure within 21 days. For more information, visit Companies House. to Companies House within 15 days of agreement from all members of the company. Once filed, you will need to issue new share certificates to the shareholders. Please remember, changing the share class may affect dividend payments. Please note: you will need to record the new share class information when your confirmation statement is due. Unfortunately, we do not offer a joint shareholders option at incorporation due to legal formalities. However, you may able to do so with Companies House - 0303 123 4500. If the shareholders jointly held, for example, 100 shares, then the information would need to be shown as follows. If you are unsure about how many shares to issue or the structure, you should seek professional advice from an accountant. Otherwise, you could end up making the share structure unnecessarily complex or not fit for purpose.